Rev. John LATHROP (1584 – 1653) was an English Anglican clergyman, who became a Congregationalist minister and emigrant to New England. He was the founder of Barnstable, Massachusetts. John was Alex’s 10th Great Grandfather; one of 2,048 in this generation in the Shaw line through his son Barnabas. He was also Alex’s 9th Great Grandfather; one of 1,024 in this generation of the Miller line through his son Samuel. Rev. John Lothrop (also spelled Lothropp and Lathrop) was born Dec 1584 in Etton, East Riding Yorkshire, England. His parents were Thomas LOTHROPP and Mary HOWELL. He married Hannah HOUSE in England, on 10 Oct 1610. On 22 Apr 1632, he was arrested in London, prosecuted for failure to take the oath of loyalty to the established church and jailed in The Clink prison. While he was in prison, Hannah became ill and died. The Bishop of London ultimately released him on bond in May of 1634 with the understanding that he would immediately remove to the New World. With his group, John sailed on the Griffin and arrived in Boston on 18 Sep 1634. He married Anna HAMMOND shortly after his arrival. John died 8 Nov 1653 in Barnstable, Mass. Hannah Howse was born in 1594 in Ashford, Kent, England. Her parents were Rev. John HOWSE and Alice LLOYD. Hannah died 16 Feb 1633 in London, England. Anna Hammond was born on Jul 4 1616 in Lavenham, Suffolk, England. Her parents were William HAMMON and Elizabeth PAYNE,. Anna died on 1 Sep 1685 in Barnstable, Mass. Lowthorp is a surname derived from the small parish of Lowthorpe in the wapentake of Dickering in the East Riding of Yorkshire, England. 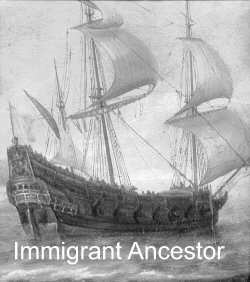 Rev John Lothropp, the first immigrant of this surname to the New World arrived in 1634 on the ship Griffin. He is considered the founder of Barnstable, Massachusetts. Mark Lothrop ofBridgewater, Massachusetts immigrated before 1643 and was probably Rev John’s cousin. Lowthorp family history has been traced back as far as the 13th century. The most common modern spellings are Lathrop and Lothrop. John was one of the first in our family to go to college, attending Queens’ College, Cambridge, where he matriculated in 1601, graduated with a BA in 1605, and with an MA in 1609. John Lothrop soon located in Egerton, 48 miles southeast from London, in the Lower Half hundred of Calehill, Lathe of Scray, county Kent, as curate of the parish there. To this living he was appointed about 1611 by the Dean and Chapter of St. Paul. It was probably his first and only parish charge as a minister of the English Church. Here Mr. Lothrop labored faithfully as long as his judgement could approve the ritual and government of the Church. But when he could no longer do this, we find him conscientiously renouncing his orders and asserting the right of still fulfilling a ministry to which his heart and his conscience had called him. In 1623 he renounced his orders and joined the cause of the Independents. 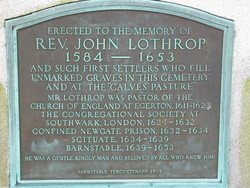 Lothropp gained prominence in 1624, when he was called to replace Reverend Henry Jacob as the pastor of the First Independent Church in London, a congregation of sixty members which met at Southwark. Church historians sometimes call this church the Jacob-Lathrop-Jessey Church, named for its first three pastors, Henry Jacob, John Lothropp and Henry Jessey. 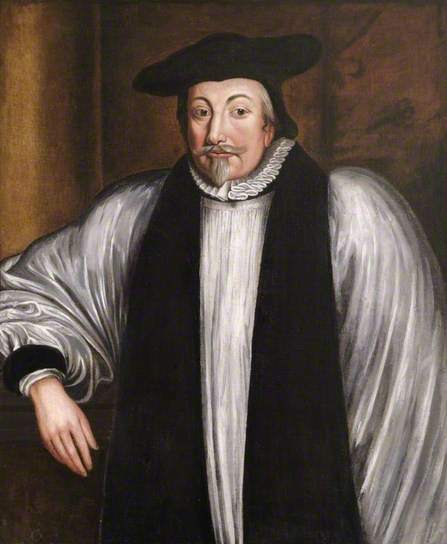 They were forced to meet in private to avoid the scrutiny of Bishop of London William Laud. Following the group’s discovery on April 22, 1632 by officers of the king, forty two of Lothropp’s Independents were arrested. Only eighteen escaped capture. They were prosecuted for failure to take the oath of loyalty to the established church. In 1632, Rev. John LOTHROP was arrested in the house of one of his congregants along with 42 of his congregation including his wife and two of her siblings three of , Samuel Hawse and Perninnah Hawse. They were brought before the Court of the High Commission and were charged with sedition and holding conventicles. The political nature of the charge of sedition , and the antique language of “conventicle’ [ a private meeting to hear illegal preaching] renders the charges unclear to modern ears. The charges were, however, deadly serious and the court proceedings unimaginable. The accused had none of the rights of modern citizens. The court was an inquisition, where the accused were forced to testify against themselves, with our counsel. The process was so intimidating that many people were driven to flee. It was one of the driving forces in the Great Migration to New England. It was no dispute over prayer books and vestments. It was about life, death, and salvation. First, what was the Court of the High Commission? It, along with the Court of the Star Chamber, was a Royal Prerogative Court [King’s Rights], originally created in the time of Henry VII [1485-1509]. These courts were separate from the Civil Courts, or Common Law Courts, which operated on the basis of precedent, and the rights of English people under the Common Law. Originally, these courts were established under the King’s right to protect individuals from abuse in Common Law Courts. Under the Elizabeth I and the Stuart Kings [James I and Charles I], these courts were used by the Church of England to suppress those who sought to reform the church, or to seek a different path to salvation, using court rules that were in clear violation with the Common Law. They came down, with extreme severity, on Separatists in particular. Because of their covenant relationship, Separatists believed that every congregation could be a church unto itself, and could elect it’s own Ministers, by vote of it’s elders, based upon the model of the early Christian church [pre-Constantine]. To do so meant they had no need of the Church of England, and did not accept the authority of the Bishops. This was unacceptable to the Crown. As famously said by King James I, “ No Bishop, no King”. Since the King was the head of the Church of England, and appointed the Archbishop, he wanted one church with order and conformity. To the King, the Separatists position implied anarchy and chaos, and must be stopped. As James I said further, “ I will harry them out of the land”. protection from cruel and unusual punishments. All of these rights were suspended for those, such as the members of Rev. Lothrops congregation, who were brought before the Court of the High Commission in May 1632. The Ministers and there flock faced brutal treatment. For the high crime of publishing tracts critical of the Bishops many ministers had their ears cut off, their faces branded and were confined to prison for life, which meant death within a few months or a few years at most. When one was brought before the court, the requirement was to sign an oath of Allegiance to the Church of England, to forswear any contrary belief or practice and to answer any question posed by the judges,consisting of Laud and five other Bishops. To do so meant to abandon their right to choose their own Minister, to hear preaching and to attend Bible study with a Minister of their choice. They believed their own souls to be at stake. They were not allowed any of the basics of a fair trial, and certainly faced cruel punishment. So what did they do? They refused to swear the oath and were jailed. Some died in prison, some were released and fled to America, and some fought for Parliament in the English Civil War. Then they were then all taken to the New Prison. Peninah Howse is then asked to take the oath, but she refused. Laud – “Will you trust Mr Lothrop and believe him rather than the Church of England? They were jailed in The Clink prison. All were released on bail by the spring of 1634 except Lothropp, who was deemed too dangerous to be set at liberty. While he was in prison, his wife Hannah House became ill and died. His six surviving children were according to tradition left to fend for themselves begging for bread on the streets of London. Friends being unable to care for his children brought them to the Bishop who had charge of Lothropp. The bishop ultimately released him on bond in May of 1634 with the understanding that he would immediately remove to the New World. 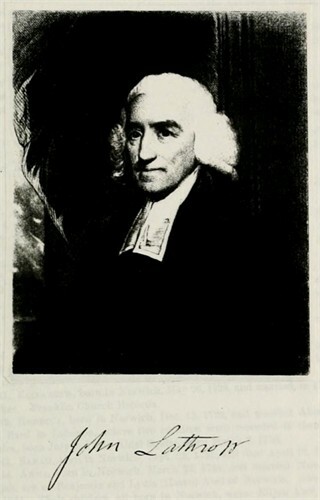 Lothrop was told that he would be pardoned upon acceptance of terms to leave England permanently with his family along with as many of his congregation members as he could take who would not accept the authority of the Church of England. Lathrop accepted the terms of the offer and left for Plymouth, Massachusetts. With his group, he sailed on the Griffin and arrived in Boston on September 18, 1634. He married Anna Hammond (1616-1687) shortly after his arrival. Lothrop did not stay in Boston long. Within days, he and his group relocated to Scituate where they “joyned in covenaunt together” along with nine others who preceded them to form the “church of Christ collected att Scituate.” The Congregation at Scituate was not a success. Dissent on the issue of baptism as well as other unspecified grievances and the lack of good grazing land and fodder for their cattle caused the church in Scituate to split in 1638. Lothrop petitioned Gov. Thomas Prence (Our Ancestor) in Plymouth for a “place for the transplanting of us, to the end that God might have more glory and wee more comfort.” Mr. Lothrop and a large company arrived in Barnstable, October 11, 1639 bringing with them the crops which they had raised in Scituate. There, within three years they had built homes for all the families. After the determination of the congregation to “set down at Mattacheese,” on the 26th of June a fast was held at Scituate, where this colony were residing, “that the Lord in his presence” go with them to this new land. Rev. John Lothrop, the beloved pastor of the church there, by his letters, found among Governor Winslow’s papers, has furnished many facts concerning the trials of himself and associates as to where the settlement should be. Some historians assert that Joseph Hull, Thomas Dimock and their few associates had settled here during the summer, or in advance of Mr. Lothrop and his associates; and there are circumstances that substantiate that. On June 4, 1639 (June 14, N. S.), the colony court granted permission to Messrs. Hull, Dimock and others “to erect a plantation or town at or about a place called by the Indians Mattacheese;” and Rev. Mr. Lothrop, in his diary, said, that upon their arrival at Mattacheese, “After praise to God in public was ended, we divided into three companies to feast together—some at Mr. Hull’s, some at Mr. Mayo’s, and some at Br. Lumbard’s Sr.” Prior to this—sometime in 1638—Rev. Stephen Bachilor and a few associates made a fruitless attempt to settle in what is now the northeastern portion of Barnstable. The location was for a time considered as a part of Yarmouth; hence some writers make Rev. Bachilor a settler of Yarmouth. There is no other record of the settlement of Barnstable until the arrival of Rev. John Lothrop and his associates on the 21st of October, 1639 (N. S.). The greater part of Mr. Lothrop’s church accompanied him to Barnstable, leaving the remaining few “in a broken condition.” Besides Joseph Hull and Thomas Dimock and their associates as mentioned in the grant, we find here in the autumn of 1639, John Lothrop, the pastor, Mr. Mayo, Mr. Lumbard, sr., Isaac Wells, Samuel Hinckley, Samuel Fuller, Robert Shelley, Edward Fitzrandal, Henry Ewell, Henry Rowley, James Cudworth, William Crocker, John Cooper, Henry Cobb, George Lewis, Robert Linnell, William Parker, Edward Caseley, William Caseley, Henry Bourne, Anthony Annable, and Isaac Robinson. The town was incorporated September 3, 1639, and on the first Tuesday of December, the same year, its deputies took their seats in the general court. Lothrop began construction on a larger sturdier meeting house by Coggin’s (or Cooper’s) Pond, which was completed in 1644. This building, now part of the Sturgis Library in Barnstable, Massachusetts is one of John Lothrop’s original homes and meeting houses, and is now also the oldest building housing a public library in America. Since Reverend Lothrop used the front room of the house for public worship, the library is also the oldest structure still standing in America where religious services were regularly held. This room, now called “The Lothrop Room,” with its beamed ceiling and pumpkin-colored wide-board floors, retains the quintessential early character of authentic Cape Cod houses. Rev. 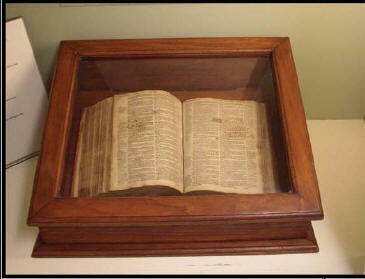 John Lothropp’s bible brought to America by Rev. John Lothropp onboard the Griffin in 1634. Rev. John Lothropp was a religious leader in Plymouth Plantation where he founded three churches which are still in existence. John brought The Lothrop Bible with him aboard the “Griffin” on his trip to America in 1634. 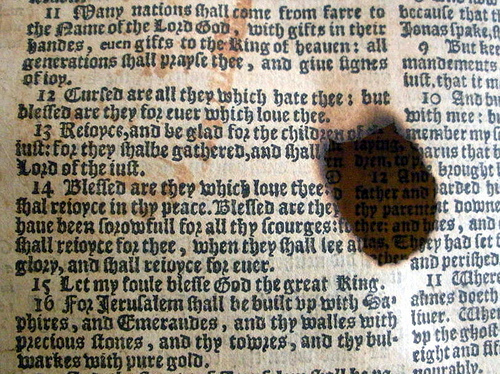 During the voyage, while at evening devotions, he spilled hot candle wax on the open book which burned through several pages, causing holes about the size of a shilling. Before landing, he carefully repaired most of the damaged paper and filled in the missing text from memory. A few of the holes in the pages remain. Barnstable is named after Barnstaple, Devon, England. The area was first explored by Bartholomew Gosnold in 1602. It was one of the first towns to be settled, in 1638, and was incorporated in 1639, as were the other Cape towns of Sandwich and Yarmouth. The early settlers were farmers, but soon fishing and salt works became major industries in town. Thomas’ wife Sarah Learned was born 30 Sep 1604 in Bermondsey, Surrey, England. Her parents were Wiliiam Learned and Judith Gillman. She first married Thomas Ewer. Sarah died in 1652 in Barnstable, Barnstable, Mass. Thomas was probably in Egerton, about 1621, as we infer from his own deposition, taken April 4, 1701, in which he states that he is “about 80 years of age.” The will of his father designates him as his eldest son, which is proof that the John who was baptized in 1617-18 was not living. The probability is that his birth succeeded the withdrawal of his father from the curacy of the parish church in Egerton, Kent, where the older children were recorded. At least this is certain, that the baptism of his older sister is the last baptism at Egerton found on the copy of the baptisms which the father made. In 1641 Thomas Lothrop is reported as land surveyor at Barnstable, and in 1643 was one liable to bear arms. He became quite a large landholder and an enterprising business man. He was enrolled as freeman June 3, 1656, He served the town in several offices, indicating his standing as in honor among his fellow townsmen, His death took place in 1707. Jane’s husband Samuel Fuller was born 1608 in Redenhall, Norfolk, England. His parents were Edward Fuller and Ann [__?__]. Samuel died 31 Oct 1683 in Barnstable, Barnstable, Mas. Mayflower passenger. died Oct. 31, 1683, one of the last survivors of the Mayflower. Jane was baptized in her father’s church in Egerton, County of Kent, Sept. 29, 1614. She came with her father to America in 1634, and was married in Scituate, April 8, 1635, “ye 4th day of the weeke,” by Capt. Miles Standish, of Plymouth, to Samuel Fuller. This marriage was solemnized at the house of Mr. James Cudworth. Barbara’s husband John Emerson was born 26 Feb 1625 in Bishops Staffordshire, Hertfordshire, England. His parents were Thomas Emerson and Elizabeth Brewster. After Barbara died, he married 1660 in Salem, Essex, Mass to Ruth Symonds (b. 1640 in Salem, Mass. – d. 23 Feb 1702 in 1Glouchester, Essex, Mass.) John died 2 Dec 1700 in Glouchester, Essex, Mass. Mr. Savage supposes this John Emerson may have been of Ipswich, Massachusetts, and that John, who came over in the ship Abigail, 1635. He is entered on the ship list as a baker, age 20, and as Mr. Coffin supposed, the son also of a John Emerson. Joseph’s wife Mary Ansell was born 1629 in Barnstable, Barnstable, Mass. Her parents were John Ansell and [__?__]. 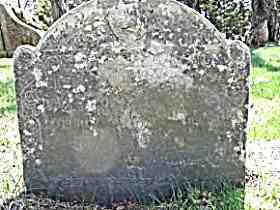 Mary died 23 May 1713 in Barnstable, Barnstable, Mass. Joseph Lothop was the Eastham clerk . Joseph Lothropp and Mary Ansell marryed alsoe by him (Brother Thomas Hinckley) Dec.11, 1650.” He settled and lived in Barnstable, where his name on the local records show him to have been an enterprising and honored man. He was a deputy for the town in the general court of the State for fifteen years, and for twenty-one years served as one of the selectmen of the town. On the organization of the county he was appointed the register of the probate court, and recorded in 1666 the first deed put on record in the county. The court had appointed him in 1653 to keep the ordinary of the town. He was admitted freeman, June 8, 1655. In 1664 we find him an acting constable, and in 1667 a receiver of excise. That he was also in the military line is shown in the titles of lieutenant and captain which successively mark his name. Mr. Freeman, in his history of Cape Cod County, speaks of him, as a “conspicuous member of the Council of War in 1676.” He also reports Lieut. Joseph Laythorpe and his brother Barnabas Laythorpe as commissioned to hold select courts in Barnstable in 1679: and names both of these brothers among the agents for the settlement of Sippecan. His standing is still further shown in a letter front Capt. William Basset written from Casco, in September, 1689, to Gov. Thomas Hinckley, reporting his skirmishes with the Eastern Indians. At the close of this report the captain presents his own and his lieutenants service to the Governor, Esq. Lothrop, and Mr. Russill. We know enough of that day to be assured that none but a prominent and public man would be thus complimented. volumes of classics and sermon books, the inventory amounting to £8,216. One other item of the inventory-” three negroes, “-shows that it belonged to an age past now beyond recall. Benjamin settled in Charlestown, Mass., where he was a man of note, holding the office of first selectman in 1683. Goodwife Martha Lathrop was admitted to the church in Charlestown in 1660. Abigail’s husband James Clark was born about 1636. His parents were Thomas CLARKE and Susanna RING. James died 29 Feb 1711/12 Stratford, CT.
John’s second wife Hanah Fuller was born 1645 in Barnstable, Barnstable, Mass. Her parents were John Morton and Lettice Hanford. She first married 1686 in Boston, Suffolk, Mass to John Fuller (b. 1640 in Plymouth – d. 20 Oct 1692 in Barnstable). Hannah died Oct 1738. Lothropp Family Foundation: The Foundation’s purpose is to preserve and memorialize the historical events in the lives of Rev. John Lothropp and Mark Lothrop and their descendants. The principal source for genealogical information on the Lo-Lathrop family is “A Genealogical Memoir of the Lo-Lathrop Family in this country embracing as far as known the descendants of The Rev. John Lothropp of Scituate and Barnstable, Mass., and Mark Lothrop of Salem and Bridgewater, Mass. the first generation of descendants of other names.” by Rev E. B. Huntington, AM; Ridgefield Ct. 1884. A searchable online version of this book is available on this website. A description of the village of Lowthorpe on the local government website. This entry was posted in 11th Generation, 12th Generation, Artistic Representation, Be Fruitful and Multiply, College Graduate, Dissenter, Double Ancestors, Historical Monument, Historical Site, Immigrant - England, Line - Shaw, Pioneer, Public Office, Storied, Wikipedia Famous and tagged Barnstable, Church without a Bishop, Slave Owner, State without a King. Bookmark the permalink. Delight Lathrop, Rev. John’s ..granddaughter married John Griste (b. July 21, 1734). He is my paternal ancester, but I have also found great delight in researching Rev. John’s sacrificial ministry. I do find it ironic that Delight married the grandson of one of the founders of the Episcopal (the fancy word for what Rev. John suffered such persecution) Church (even have the services in their home) until the first Episcopal church was built in Norwich CT.! His godly stand has been honored by offspring among presidents and other Americans of great respect. I have not found how long Gristes continued to be Epicopalians. By the late 1800’s my great grand parents (Chester and Amanda Grist) brought their family up in the Baptist church which I first attended at the age of five weeks! You have stated that Rev John Lothropp was incarcerated in the Clink Prison. The plaque at the cemetery where he was buried states that he was imprisoned in Newgate prison, 1632-1634. At the trial by the High Commission, Bishop Laud ordered that the dissenters (Lothropp and his followers) “be removed some to one prison and some to another.” I have contacted the National Archives in London. I was told that there are no extant records to prove where Reverend John Lothropp was incarcerated. There ARE records that attest that some of those arrested with Rev Lothropp were sent to the Clink Prison. Their testimonies were of the lenience of the jailers in allowing them to go home during the day and return at night. Other records (vast numbers) attest that Reverend John Lothropp was never released from prison during his two years of incarceration except once and that was when his wife was dying and he commended her to heaven and was returned to prison. In fact, Nathaniel Morton, a close personal friend of Reverend Lothropp in America, says that Reverend Lothropp was kept in “close durance” during his years of incarceration. So, was he in the Clink? This is the question! It seems to me that those who were so grateful for the relaxed rules they enjoyed during their incarceration would have mentioned that yes, they were free to come and go during the day, but their beloved minister was not. None of them mentioned Reverend Lothropp as being incarcerated with them. And why did that historical work which contained quotes from those incarcerated in the Clink not have one from Reverend Lothropp, the leader of the group, if he were in fact there with them? Moreover, some research suggested that the Clink keepers were notoriously lenient with their prisoners. In other words, it was common knowledge. When you consider that Bishop Laud accused Reverend Lothropp, the leader of these dissenters, as being “desperately heretical” “schismatical” and “dangerous” would he send him to such a prison? Reason suggests that perhaps he was NOT with them in the Clink. The Clink Prison was very small. British records I researched said it was just two rooms and held as few as five or as many as twenty-two. It was located under the “mansion house” or the “residence” of the Bishop of Winchester. It was also regarded as having the most “handsome lodgings” of all the prisons scattered throughout London. Important background: Sixty had been in the meeting when the tracker came to arrest them. Some escaped and forty-two ended up being arrested. After the arrest, a few others escaped. In the end, twenty-eight of Lothropp’s group went to trial. And the clear evidence (statements from the High Commission trial) is that after the trial some were sent to one prison and others to another. The historians Burrage and Waddington state that the Clink was the place of the incarceration of many of Lothropp’s followers. TRUE. That’s an indisputable fact. Charles Leonard Lathrop (In This Place, Lebanon, CT, 1976) specifies the Clink as the place of Lothropp’s incarceration; however, none of the sources he cites actually specifies the Clink as THE place where Lothropp himself was incarcerated. Charles Leonard Lathrop himself stated that he drew some conclusions based on his “own addenda, anecdotes, and speculation” because so much of history was yet “shrouded in the dim ages.” He also regards Huntington as the “principal and most definitive of all the Lathrop historians.” Huntington cites the Clink, Newgate, and the Gatehouse as the places of incarceration, but he does not identify the specific place where the Reverend himself was imprisoned. At one point, several of the “conventiclers” (those who attended the secret and clandestine meetings to hear Rev Lothropp) escaped from the Bishop’s Prison, also known as the “New” Prison. When that happened, Bishop Laud demanded that none of the dissenters be returned there and that the missing be apprehended. IT STANDS TO REASON THAT THE LEADER OF THIS DISSENTING GROUP WOULD NOT BE SENT TO A LENIENT PRISON IN THE FIRST PLACE. Moreover, there are records that state that while in prison, Reverend Lothropp CONVERTED seventeen people to the cause of freedom of conscience. Since the Clink was so small a prison and evidence indicates it wouldn’t even hold all of Lothropp’s dissenters, how could he have converted seventeen others???? ?